Brooke’s life has fallen apart and she’s been uprooted from Texas to her grandmother’s home in Juniper Falls. Her mother is a shell of the person she used to be and Brooke feels totally on her own in this hockey-obsessed town. 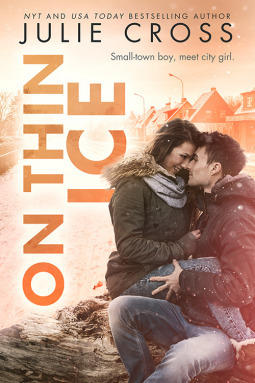 When she witnesses a hazing ritual that goes too far, she has local hockey star Jake Hammond seeking her out asking for her silence. Joining the new girl’s hockey team means she’s seeing a lot more of Jake and her determination to keep her head down and just get by doesn’t seem to be working. Jake’s life has always centered around hockey and now, as a senior and captain of the team, his future seems set and everything he’s worked for is just within reach. All of that is in jeopardy when a freshman teammate is hospitalized, and all fingers are pointing to Jake. With mounting pressure from his father and his coach, Jake starts to question the "win at all cost" mentality of those around him and must choose between doing what’s right or doing what’s expected of him. I thoroughly enjoyed Cross’s previous two entries in the Juniper Falls series. Her characters are usually well-developed and dealing with real life issues that are relatable. Plus, there’s plenty of swoony romance. In On Thin Ice there is a heavy focus on school athletics and the toxic environment that can develop when those in charge lose sight of the individual players and winning is the only goal. This often meant Jake was the linchpin at the expense of the development of Brooke’s character. Her background remained largely a blank slate and issues with her mother were glossed over. Even so, I was invested in Jake’s situation found myself wanting to give him gentle nudges to do the right thing. And while it seemed most of the adults and authority figures in his life had questionable ethics, I loved that his uncle Oz, also the town sheriff, was a steady force and was unwavering in his determination to make things right. While this is the third in a series of companion novels, readers won’t have a problem if this is their first visit to Juniper Falls. There’s enough exposition to fill in the blanks. Those who have enjoyed the previous books will appreciate revisiting characters they already know – Haley, Fletcher, Claire and Tate are all there (and here’s a big cheer for Mike Steller’s role!) – and catch up with the latest in this small town. My hope is that Cross continues this series because I’m still wanting more of this cast of characters I’ve come to know and love. This sounds really interesting!! I'm glad you enjoyed it! They sound like really great characters/characters you become invested in. I love small town romances!!! I hope you do, Rachel! I enjoy this series so much! We moved from Brooklyn to Highland Park (1 square mile town) when I was 13. It was a culture shock for sure, but there were nice things about it too. I have been wanting to read this series for so long, I love hockey though :D and I do enjoy it in books. I am such a fan of this series. And it's fun that there's actual hockey involved instead of just a mention that a character is a hockey player. I'm a big fan of contemporary romances where you don't need to invest in an entire series to enjoy reading. These remind me a little of adult versions of Katie McGarry novels, which I've really enjoyed in the past. I typically find books featuring sports a little confusing, we Australian's don't tend to follow much American sport but hockey is one I can get on board with. Great review Tanya and so glad I've discovered your blog! I would like to start with the first in the series! This sounds good and looks like the series is good tho. I will have to grab these. How weird, I saw this book pop on my Amazon recommended list and knew I had the other books in the series on my radar but hadn't even heard anything about this one. Now I really want to read because this sounds so good. I love when it involves the girls getting to play sports for once. Although, I am sad to see that some of Brooke's characters development and story is brushed aside for Jake's. Jake did seem to take center stage at times but Brooke’s story was still a good one. I totally recommend this one... and the whole series!